This Week: A Bit of Fry & Laurie, the next best thing after Monty Python. I started watching because my boyfriend was putting down a solid five episodes a day, and it didn't take long for me to pick up the habit. It's important to have comfort TV you can put on in the background or settle in with to lift your mood without really committing. Futurama and 30 Rock are a great place to start, but eventually, I'd seen every episode five times and catalogued every sneaky joke by heart. I needed something new. That's where Fry and Laurie came in. Best Episode: It's nearly impossible to pick a favorite, but the "concerning language" sketches (season 1, episode 2 and season 2, episode 6) are pure gold. Why You'll Love It: Some British TV — like Black Books or The Office — can be awkward and cringe-worthy to the point that it's only watchable in short bursts. Binge too long, and you'll bite your lip bloody and your heart rate will rise to dangerous levels. A Bit of Fry & Laurie, though, is decidedly more ridiculous. You can catch the punchlines while you multitask around the house, or you can really pay attention and enjoy the truly next-level physical comedy from two ever-changing actors. And, while a lot of '90s non-sitcom TV has trouble staying relevant, this one is just as hilarious now as ever (probably because it's not as topical as a lot of other shows in its vein). When it's not jumping between period pieces and segments set in a modern veterinarian's office, the show also mixes live performances and pre-recordings with seamless ease. Don't even get me started on the musical numbers. Though you may not know this unless you've recently seen his CDs on sale at Starbucks, but Hugh Laurie is a pretty accomplished musician, and he whips out that talent regularly on Fry & Laurie. 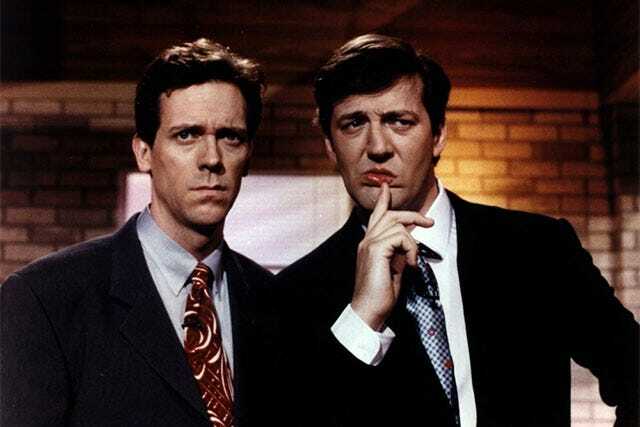 Also, fun fact: Fry and Laurie were introduced to each other by Emma Thompson. So, you know it's gold.